Tamilnet the LTTE website is operational. LTTE cadres that fled during conflict are returning. LTTE families are being given land in high security areas. LTTE cadres that refused to be rehabilitated are now released with no reason and LTTE fronts listed under UNSC Resolution 1373 have been deproscribed without any reason Australian Tamil Congress is one such deproscribed LTTE front – what happens thereafter? The men who supported terror are returning to create a new chapter in turmoil and begin a new wave of trouble so that they can sit pretty in their foreign climes and make money landing arms deals, brushing shoulders with VVIPs and securing personal benefits for themselves. Will Tamils fall prey to become guineapigs again? This is R T Rajeswaran. He is a doctor too. 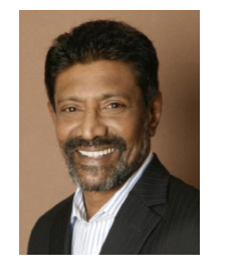 He is also the head of the Australian Tamil Congress. The ATC is under the umbrella of the Global Tamil Forum headed by Father Emmanuel and the Australian counterpart of the British Tamil Forum. Noteworthy is that these LTTE fronts were created soon after the demise of the LTTE leader. What Tamils in Sri Lanka must realize is that these entities now coming forward claiming to be the voice of the Tamils did not voice a word against LTTE terror on Tamils, was stoic silent about LTTE kidnapping of Tamil children and turning them into child soldiers, did not issue any statement when LTTE were killing fleeing Tamil civilians and the calls on their website to remember their ‘heroes’ is to remember dead LTTE cadres and not Sri Lanka Armed Forces personnel. 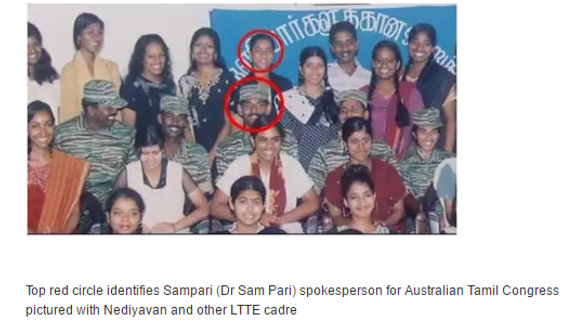 Dr Sam Pari (alias Sampavi Parimalanathan), Spokesperson, Australian Tamil Congress was in fact a LTTE cadre. Her handwritten application form to join the LTTE was exposed by the Sri Lanka defense ministry. It is very clear that with the new government removing all restrictions all LTTE fronts and their representatives are now free to come back to Sri Lanka and create more tensions and trouble. What the Tamil people must now ask themselves is whether they are willing to become guineapigs for another new wave of trouble these people will not plot on behalf of higher powers that must be funding them. All they want is some foolish people to provide the manpower and the campaigning and fundraising will be easily done by them as was done in the past. It is good for all citizens to wake up to these ground realities. Do we want to have another 30 years of mayhem? anti-Buddhist of course and ant Sri Lankan. So the racist cancer knows this is the best time to get their drealam. It is the Indian Empire who selected the current government. Tamils are part of the Indian Empire. The British ‘divide & rule’ is on. Neo-colonisation of Lanka has begun with RW led UNP in place.